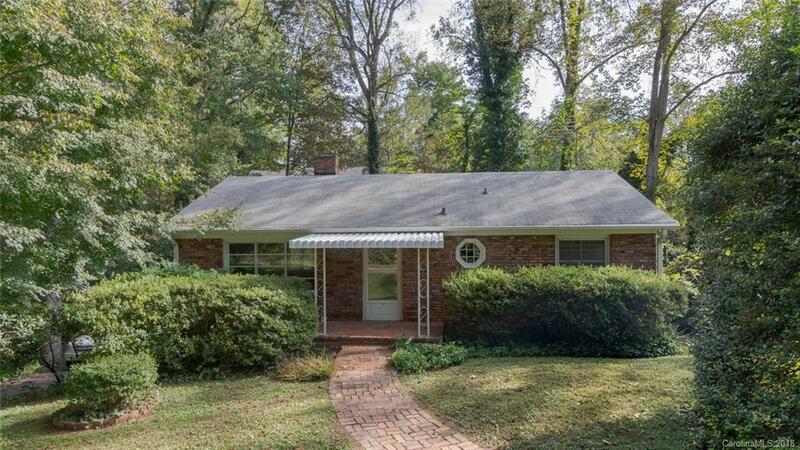 HOT W AVL LOCATION ALERT!!!! Don't miss out on this SUPER SWEET ranch HOME...situated on 0.31 acres on a quiet tree-lined street w/sidewalks in West Asheville's HIGHLY DESIRABLE MALVERN HILLS NEIGHBORHOOD! If you like level, hardwood floors and the charm/character of a vintage home (check out the unique bathroom window) then this is your EXCELLENT OPPORTUNITY to double your square footage to almost 2,000 sq ft by refinishing the daylight walk-out basement!!! Take advantage of the incredibly high ceilings in the basement! Renovate the basement (especially the room with the floor to ceiling wood-burning fireplace wall)! Transform it into the IDEAL large, finished, family room it is begging to be! Become AVL's next Chip & Joanna Gaines & w/ minimal cosmetic updating! Take this SOLID, well-maintained, 3 BR, 1BA home to a NEW dimension! The unfinished basement would make a great studio space, workshop or second level of living! Live on one level & rent the other! Endless possibilities!